"There is much pleasure to be gained from seemingly useless knowledge!" Often, when I set out to research some information on a specific subject I'll come across a little totally unrelated tidbit that I find interesting. I would just jot it down for later, and now after a while of collecting, a fun list of random monkey trivia sort of created itself. Everyone seems to be curious about monkeys and I thought you might find this little list of monkey trivia as interesting as I did. Now that I have it going, I promise to add to it faithfully every chance I get, and if you have something you would like to add, please share! 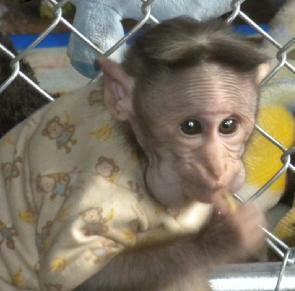 This is BernieMacq a young Bonnet Macaque. Bonnets store food in cheek pouches much like a hamster. Foraging on the ground is dangerous business and this is natures way of allowing them to gather as much food as possible, leaving their limbs free to quickly escape to the safety of tree tops away from natural predators. Bonnets are easily recognizable by the whorl on top of their heads giving them their unique "do". The origins of the word monkey are unclear, however it is believed to have come from Moneke, the name of the son of Martin the Ape in a medieval animal story. It appears also to be related to manikin, from the Dutch word manneken or "little man". Monkeys make up two of the three groups of simian primates, Old World monkeys and New World monkeys. The other group is the apes. Regardless of species, a family group of moneys is called a "troop. As of 2009, there are 81 species of New World monkeys in the Amazon basin, with new ones continually being discovered. Most primates share six basic features: forward-facing eyes (for depth of vision), eye sockets, grasping hands, fingerprints, nails (flat nail beds, as opposed to claws) and large brains. Brazil has more kinds of primates than any other country, with 16 genera and 77 species. The Democratic Republic of the Congo is second, with 18 genera and 37 species. Squirrel Monkeys are the most common monkey in all of South America and to date are the least endangered due to their large numbers and adaptability. Squirrel Monkeys are endemic to the South American country of Brazil. Old World monkeys are divided into two subfamilies, generalists and specialists. Generalists eat almost anything (omnivores) and specialists primarily eat leaves. The Barbary Macaque is the only free-living species of monkey in Europe, which was once home to many monkeys. Most monkeys are omnivorous (eat both animals and plants) some are strictly vegetarians and some even eat dirt! There are species of Old World monkeys that have large cheek pouches that enable them to feed rapidly and store their food (think, hamster) so they can eat it and swallow it later. Many New World monkeys, including the spider monkey, do not have thumbs. Capuchins and Squirrel monkeys are the only New World monkeys with pseudo-opposable thumbs. The tip of a spider monkey's tail can support the full weight of his body... really! To date, ten New World monkey species have been classified as nocturnal. (night dwellers) ALL known Old World monkeys are diurnal. Many New World monkeys have prehensile tails, a feature not shared by ANY of their Old World cousins. Twenty different vocalizations have been noted in Squirrel Monkeys. The Pygmy Marmoset is the world's smallest monkey, measuring 117-159mm (four and a half to six inches) and weighing 85 to 140 grams (three to five ounces). They newly discovered Mouse Lemur of Madagascar is smaller, (only three inches long) but as it is not a true monkey, the Pygmy Marmoset still holds the title. The largest monkey is the male Mandrill measuring almost 1 meter (3.3 feet) and weighing about 35 Kilograms (77 pounds). Grinning or pulling the lip is not a "smile". In monkeys it is a sign of aggression, along with yawning (it's actually a way of casually showing how nice and big their teeth are). Apes and Spider Monkeys swing arm-to-arm through the trees, but most monkeys don't. Instead, they run across the branches. Capuchins are quite skilled at using tools. They smash nuts with rocks and insert branches into crevices to capture food. They have also been known to use large branches to club a snake. Capuchin monkeys have been documented using different vocal sounds (words) to identify different types of predators. Most Old World monkeys have small, curved nostrils set close together. Most New World monkeys have round nostrils set far apart on flat noses. The South American Titi monkey are rare among primates in that they are totally monogamous. They mate for life and become distressed if separated for any reason, often dying if their partner is lost. They show affection by grooming, intertwining their tails and even holding hands. They have been observed nuzzling, cuddling and smooching their mates. Currently Twenty-one primate species are listed as critically endangered on the 2008 Red List of Threatened and Endangered Species. 46 are actually vulnerable to extinction, primarily due to habitat loss. The three major predators of monkeys are hawks, humans and eagles. Monkeys are immune to the virus that causes the human "common cold"